Didn't see one, so here we are. Georgia likes to kick people off the voter rolls and not alert them, and of course they are disproportionately black. Last year, Brian Kemp, Georgia’s secretary of state canceled the registrations of over half a million Georgians because they left the state or moved to another county. Except they didn’t. The nation’s top experts in address location reviewed Kemp’s list of purged voters — and returned the names and addresses of 340,134 who never moved at all. This is the story of the mass exodus from Georgia that never happened, and the mass purge of voters by Kemp, GOP candidate for governor, through methods guaranteed to disproportionately take away the vote from the young, the poor and voters of color. It began five years ago, when Kemp stonewalled my first requests for information on purges in Georgia, first for Al Jazeera and Rolling Stone, now for Truthout and Democracy Now! It took my lawyer’s threat of a federal lawsuit, filed last week in Atlanta federal court, to blast the list of the electorally doomed from Kemp’s hands. The files recorded 530,510 voters as moved from “inactive to cancelled.” We could not decode about 80,000 addresses — and discovered that 19,118 of the voters had passed away. And the rest of the voters of this supposed mass migration? The experts ran the names through an “advanced address hygiene process,” that is, digging through dozens — up to 200 — dynamically updated databases (such as cell phone bills and tax filings), as well as limited-access files at the post office, to get the location of voters. They accomplished this with astonishing accuracy — something the state of Georgia should have done. The result: GregPalast.com has a list of 340,134 voters who never moved an inch. Kemp has sent them no notice — none — but they have lost their right to vote. It wasn’t invented by Kemp. It’s used in dozens of states, mostly those controlled by Republican election chiefs. It works like this: If you miss an election, Kemp sends you a postcard. It looks like junk mail. But if you read the block of print carefully, it asks you to return the card to Kemp after you’ve filled in the address that’s already on the front of the card. If you don’t return the card, and you miss an election, Kemp takes out his eraser and cancels you off the registration rolls. How can he do that? Legally savvy readers may know that the National Voter Registration Act of 1993 prohibits canceling the registration of a voter who chooses not to vote. However, in June of this year, the Supreme Court said election officials can purge voters if they miss elections and don’t return that postcard, but only if the failure to return the postcard is a reasonable indication the voter has moved. Last edited by frank ryan; 10-27-2018 at 07:52 PM. How difficult is it to re-register to vote in Georgia? Problem is they don't know they'll need to until they go to vote. They'll be given provisional ballots which won't end up counting according to the article. Pretty nefarious. Here people can register at the polls, so even if someone has been purged from the voter roll, they can still vote. Unfortunately it's not the case in a lot of places where these things go on. In Georgia, and other places are fewer polling places in heavily minority areas. The SCOTUS decision on the voting rights act set the stage for some of this. Last edited by frank ryan; 10-28-2018 at 02:32 PM. Strange... I wonder why they are trying to clean up their voter rolls? A federal lawsuit alleges significant problems with voting in the Peach state. With worn-out clichés about the dead voting, Chicago used to be the poster child for voter fraud. But if any state is a poster child for terrible election practices, it is surely Georgia. Bold claims demand bold evidence, and unfortunately there's plenty; on Monday, McClatchy reported a string of irregularities from the state's primary election in May, including one precinct with a 243-percent turnout. Habersham County with this precinct was very red in 2016... maybe they shouldn't have purged all these voters! Edit: I should have know... Gov. Abbott has a fix in the works for voting a straight-ticket flipping votes. I never vote a straight-ticket personally because there isn't a Libertarian usually in every contest. Last edited by Uncle Ted; 10-28-2018 at 09:22 PM. but if I vote for the republican the incivility will continue and "there will be blood in the streets"! I guess I have no choice but to vote for the Libertarian! Here's an interesting documentary that goes over the shenanigans the GOP engages in suppress voter turnout. My guess is that it's super unbiased. Political documentaries are the best. Oh wait... that was the Dems. 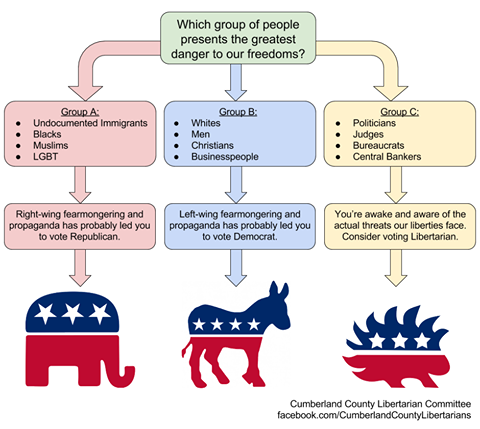 Lol, no it's super duper partisan, but still worth viewing. Last edited by frank ryan; 11-03-2018 at 05:04 PM. If I hear another person talking about how important it is to vote today, I am going to barf. Haven't the celebrities all moved to Canada yet like they promised? BTW, why don't any of them ever mention moving to Mexico? Do they have a problem with the people down there or something? thank them. They just created a new conspiracy theory for you. Yeah... I am guessing Russian hackers! Nope. They're not the enemies of the people. MSNBC is. I like how you make jokes about Russia’s campaign etc like it’s some far out conspiracy, when in fact it’s well established at this point. There have been a lot of related indictments, including specific GRU officers. Every year, just like today, I see many stories on-line about voting delays, long lines, etc. I went to my polling place this morning and there were only three people there when I arrived and only two more had rolled in while I was voting (and that takes a long time on the freaking california ballot with all of the money grabs, I mean initiatives, on the ballot). No wait, no delay, no problems. Has anyone here experienced long lines or such? I like how you make jokes about Russia’s campaign etc like it’s some far out conspiracy, when it fact it’s well established at this point. What, exactly, is well-established? That the Russians try to meddle in our elections? Absolutely. That they effectively did so in manner changing outcomes? Not so much. Interesting Evan McMullin editorial concerning Trump increasing authoritarianism post-midterms. Leaders committed to self-preservation do not curtail their efforts to dismantle checks on their power under the threat of accountability. A Democratic majority in the House or Senate is critical to reestablishing effective separation of powers and needed oversight over the Trump administration. But whether or not Democrats succeed, Trump will likely escalate his efforts to smash limits to his power. My service with the Central Intelligence Agency taught me that leaders committed to self-preservation through authoritarianism do not curtail their efforts to dismantle checks on their power under the threat of accountability. They hasten them. If Republicans hold the House and Senate, Trump will see evidence of national vulnerability. Emboldened, he will act more aggressively against threats to his presidency, including the special counsel’s investigation and Congressional consideration of its findings. If, on the other hand, the Democrats prevail in at least one chamber, Trump will not stand idly as oversight committees and the law encircle him. He will fear the consequences of his inaction more than those of any potential action. I sincerely hope that I’m wrong, but Trump has given us no reason to expect otherwise. He is prepared for this moment and we are not — at least not yet. In the months ahead, Trump and his far-right media allies will more thoroughly flood the country with conspiracies, lies and other disinformation to impede our ability to discern the truth about his corruption. Many well-intentioned Americans will probably succumb, resolving to refocus on matters closer to home, including family, work and friendships. He will continue to allow and even normalize foreign disinformation in his favor, which will become more sophisticated, effective and increasingly encouraged and mimicked by his loyalists. He will more brazenly pursue nationalist, illiberal policies to energize the far-right in order to maintain control over the GOP and provoke a more radical response from the far-left, which he will in turn use to justify additional anti-democratic measures. Hey, did McMuffin ever pay off his election debt from 2016? It is well-established that the Russians bought some facebook ads... like a couple hundred thousand dollars worth. I am not sure what those facebook ads said to convince everyone to vote for Drumpf but maybe Hillary should consider hiring those Russians to manage her 2020 campaign. McMullin certainly writes like a CIA analyst. Come on Beto! Slay the zodiac killer! !